SILKYPIX Developer Studio Pro is the latest version of the SILKYPIX series, and has been developed to pursue “Higher image quality” and “Much further fulfilling functions in order to finish the photo”. In this version by the improvement of RAW development engine “Color representation” and “Gradation” in highlight part have been improved significantly and “Natural sharp” which controls “Resolution and Blur” newly has been obtained. In addition, strongly requested from customer partial correction tool is equipped and it has become a digital developing software that strongly support customers’ photo work. From dark area to highlight, RAW development engine improves the gradation further – “Color representation” and “Gradation” in highlight part have been improved significantly. This achievement was bought by the improvement of RAW development engine and implemented by further deeply analyzing the information of RAW data, therefore it achieved the extension of the dynamic range in developing processing level. Partial correction tool (Equipped with Circular / Gradual correction filter) – You can correct partial color in the specified circle area. For example, partially if you want to change the brightness and white balance, you can easily specify the intuitive area and correct it. You can obtain a correction that were not available in previous SILKYPIX series by designating separate areas in scenes with much overexposure or underexposure, or when light sources give off two or more different colors in the same image. Completely new sharpness from superior outline detection (Natural sharp) – Generally, when sharpness is set strong, there is one side effect that the noise is emphasized in blurry outlines or out-of-focus part of the blur. A completely new focus plane and logic for detecting out-of-focus part have been developed for SILKYPIX Developer Studio Pro7 so that you can apply strong sharpness only on the focus point. L-Tone Curve for vivid high-key expressions – By correcting brightness of the tone curve with the RGB Tone Curve, colors can be reproduced with a white tinge. This is due to colors connecting to brightness during RGB processing. 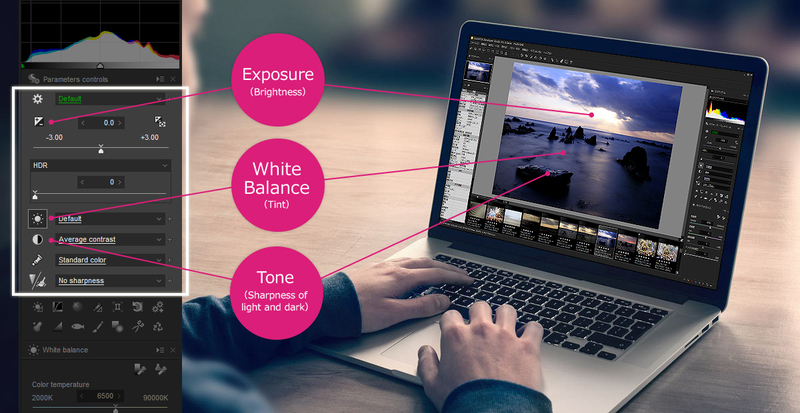 You can maintain colors even when changing brightness with the “L Tone Curve” installed in SILKYPIX Developer Studio Pro7’s tone curve. “L” refers to “Luminance,” and it is possible to adjust only luminance information with the L curve. Therefore, even with high-key finishing, the subject’s tones and vividness remain. This is a convenient function for subjects who appreciate soft expressions such as in portraits. Image Rating Compatibility – Some of photographers may have with a rating (typically a star mark) at the selection to OK cut to the camera side of the operation on the LCD monitor during shooting. SILKYPIX allows for linking and reflecting this “Rating” set on the camera. In addition, you can also edit the “Rating” on SILKYPIX Developer Studio Pro7.